This entry was posted in cooking, delicious, food, health, medicinal, nutrition and tagged carrots, cayenne, cumin, garlic, ground pepper sautéed with red onion, kale, kidney bean stew, paprika, red beets, red bell pepper, sea salt, together with fresh red & green hot peppers, turmeric on January 20, 2019 by carolkeiter. Starting from scratch in a new place without furniture and the first use of my new used kitchenware that I acquired through a local online buyers and sellers market http://offerup.com I was able to obtain these minimal pots and pans in reasonably good condition – for $20 bucks – to cook my first meal. What a deal! And here is the audio podcast itself (which unfortunately takes you away from the pictures, which follow the same storyline). I did this on the fly without scripting it. The peppers which I hadn’t known the name of are habanero (that look like mini orange tomatoes) and I also used the dark green Jalapeño peppers. I brought the red lentils to a boil, then simmered on low, adding salt, pepper and the various vegetables. In a separate pan, I started to sauté onions on low heat, adding the spices, and then gradually each of the additional ingredients to that. As I explain in the audio, after I’ve sautéd the onions, mushrooms, peppers and spices, I add it to the separately cooking lentils and vegetables. This entry was posted in delicious, diet, food, health, medicinal, nutrition and tagged amino acids, beans, bell pepper, cumin, delicious, essential amino acids, garlic, grains, ground pepper, habanero peppers, health, health benefits, jalapeno peppers, nutrition, olive oil, onion, paprika, red lentils, sea salt, soup, spices, turmeric, vegetarian on April 14, 2018 by carolkeiter. The Bell pepper was the first option, before I had a pan. After borrowing a shallow baking pan, I halved an acorn squash, scooped out the seeds, put it face down on a slightly oiled (olive oil) pan, and halved an onion, and plucked a few garlic cloves, leaving their skin on to retain moisture. Wow, all of the above were so delicious. This is the easiest way to cook, inside and outside. 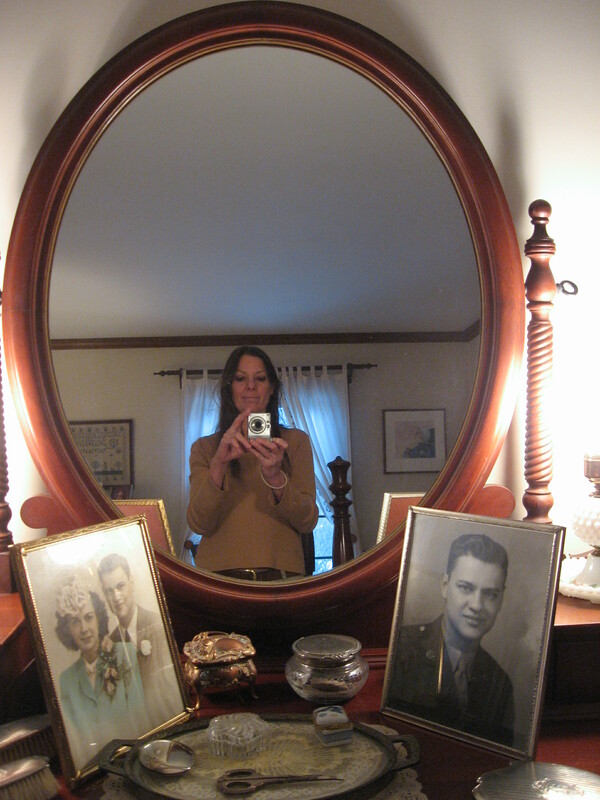 Here are the pics, showing my pretty rustic conditions, considering I’ve moved back to the United States, to a new town, Providence, Rhode Island, and into a room with no furniture – and no kitchen ware. I’m making it happen and eating very well, in conditions that are clean. And the link for my podcast is here. This entry was posted in delicious, food, health, medicinal, nutrition and tagged roasting acorn squash, roasting bell pepper, roasting garlic, roasting onion on April 13, 2018 by carolkeiter. I went through the whole process of making a Spanish tortilla, except without the added egg & milk mixture at the end. I ate it instead in bites together with pasta. 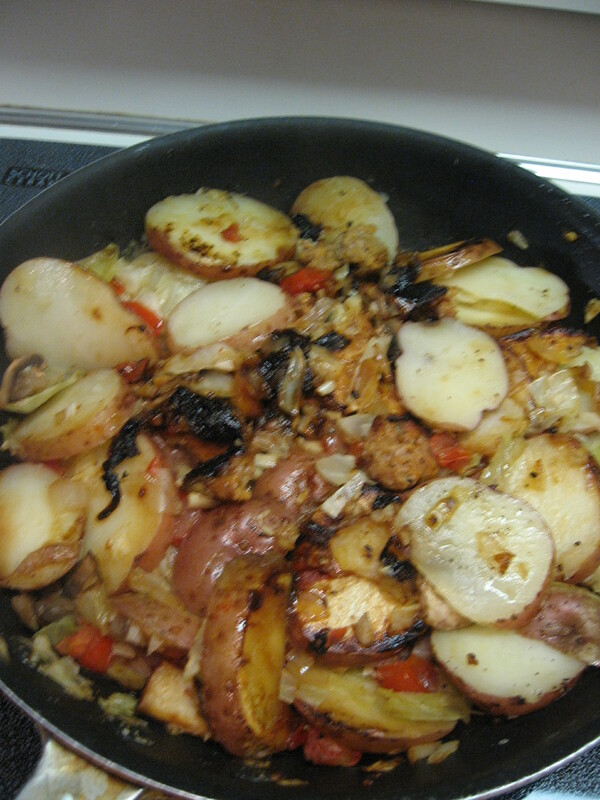 I added to the sliced potatoes, onion, garlic, cayenne pepper, (ground pepper and sea salt to every new layer added), fresh mushrooms, fresh chopped tomato. 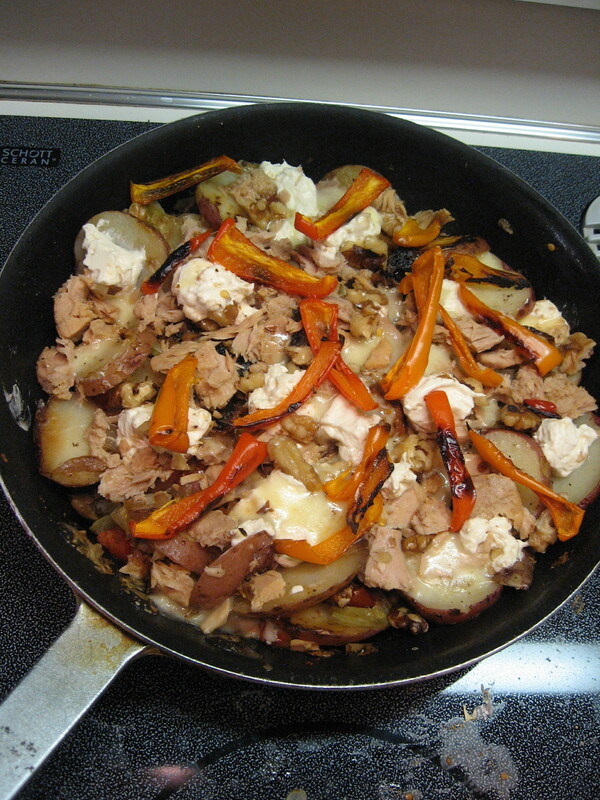 And finally after flipping the whole layered potato dish, I added walnuts, a can of tuna, chopped sharp cheddar cheese, spoons of Greek cream cheese yogurt, and topped it with the roasted yellow, red and orange sweet peppers. I ate the meal with my garlic toast, in which the bread soaked up the excess tomato juice, added chopped garlic, roasted, then poured olive oil over the piece of garlic toast. 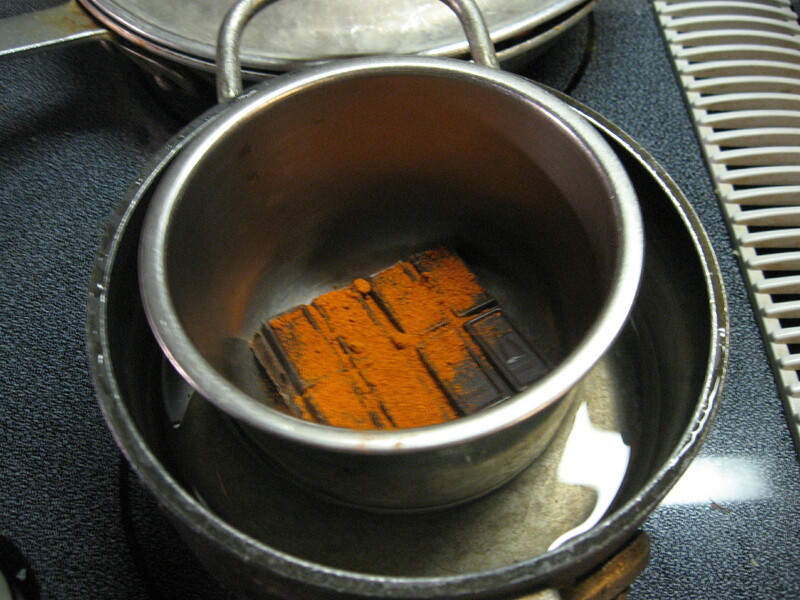 The semi-sweet baking chocolate melted in the double boiler with cinnamon and cayenne pepper, was the desert. Delicious, medicinal food at it’s best! 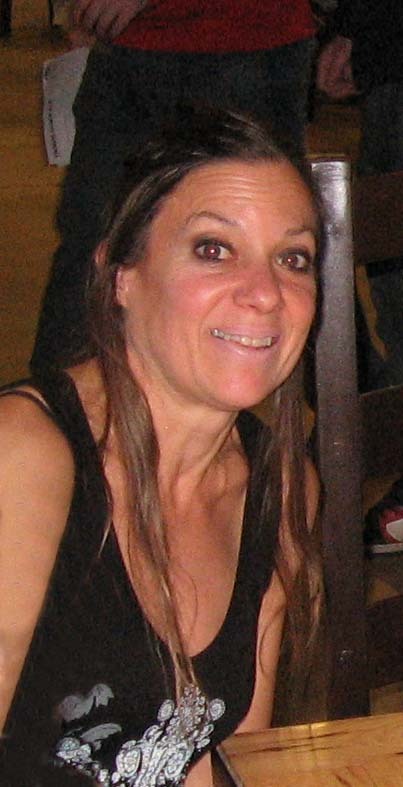 This entry was posted in delicious, diet, food, health, medicinal, medicine, nutrition and tagged chocolate, diet, garlic, health, medicinal, potato, roasted peppers, spanish tortilla, tapas on July 17, 2015 by carolkeiter. Greetings and welcome to this edition of delicious medicinal food! Carrying on with the understanding that what we do with our bodies and what we put into them is directly related to our level of health and fitness, here are some summer treats. Here’s the link to the audio podcast of creating a Cherry Cobbler, Guacamole and Spirulina fruit shake of making a Cherry Cobbler, Guacamole and a Spirulina fruit shake. 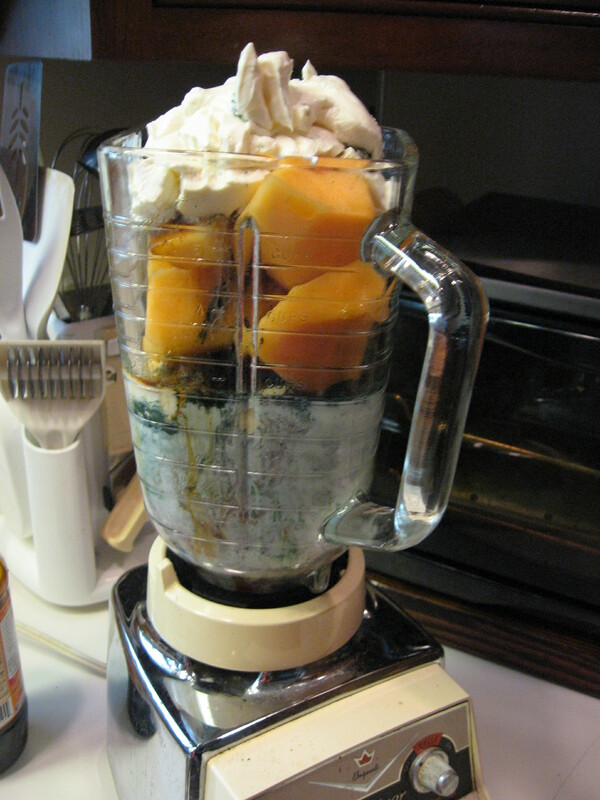 I made the shake as an appetizer. I typically like to use honeydew melon. Ripe bananas are essential. Then you can add whatever additional fruit you may have. Rather than adding ice, I like to make a concoction of milk, some cranberry juice and some scoops of greek plain yogurt. 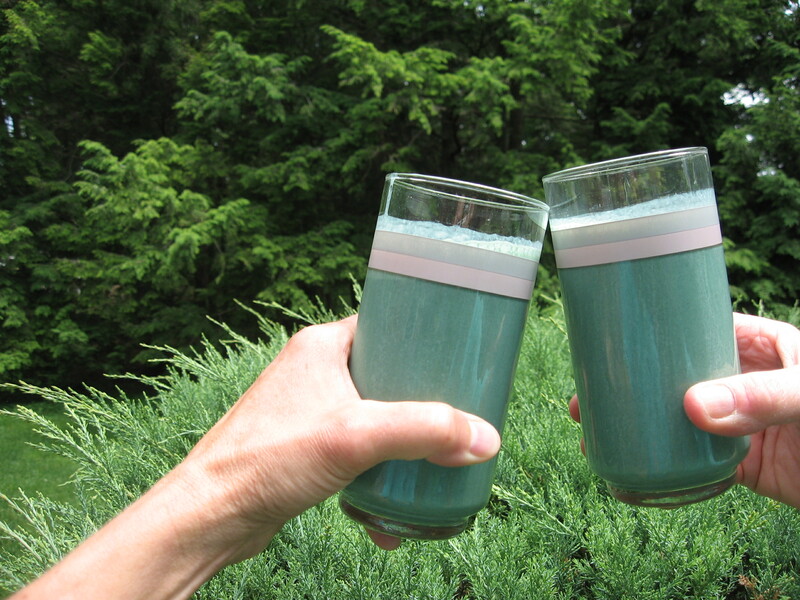 The essential ingredient I like to add to my shakes, which makes them super healthy and green, is a spoonful of Spirulina powder. I typically make guacamole ‘from my head’. I’ve made it plenty of times, and make it a little differently each time, depending on what ingredients I have available and my whim at the moment. However, the recipes will consistently always involve fresh lime juice squeezed from a real lime, cumin, salt and pepper and sliced green jalapeño pepper. 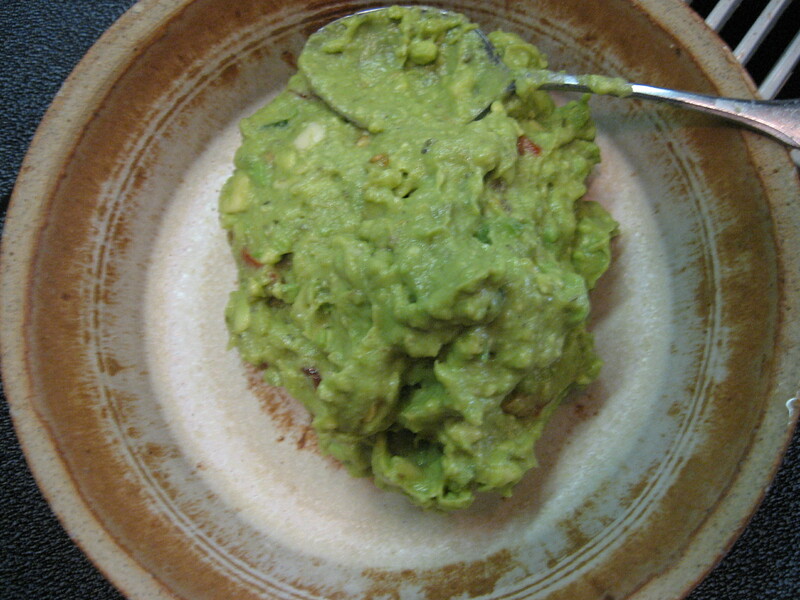 Guacamole made from a fresh avocado. Naturally, I prefer to use fresh cilantro, however this time I don’t have any on hand, so I substituted grinding some coriander in a mortar and pestle. And just to verify what I had already understood, cilantro and coriander are the same thing! I investigated a cobbler recipe, having not been familiar with making it before. I found this one, and for the most part followed it, with the exception of reducing the sugar amount somewhat. I have to say, I got rave reviews! Everyone loved it. I just poured a little whole milk over the cobbler dish, though it could be eaten with vanilla ice-cream as well, as more of a dessert. 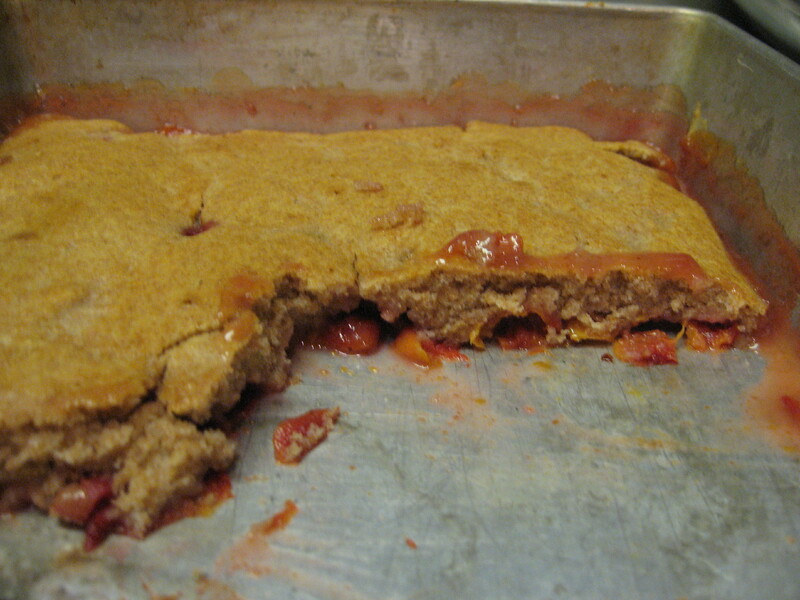 Here’s the cherry cobbler recipe that I used. Remember, less meat is better! 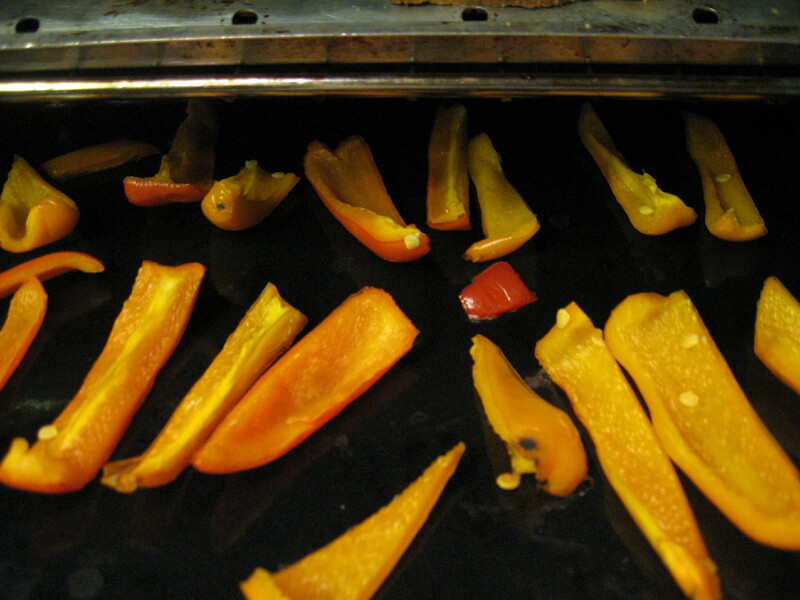 If you want to grill during the summer months, there are plenty of vegetables that are delicious on the grill! Enjoy! Mix 3/4 cup sugar, butter or margarine, flour, salt, baking powder, and milk together. Place cherries in the bottom of a 9 inch square pan. 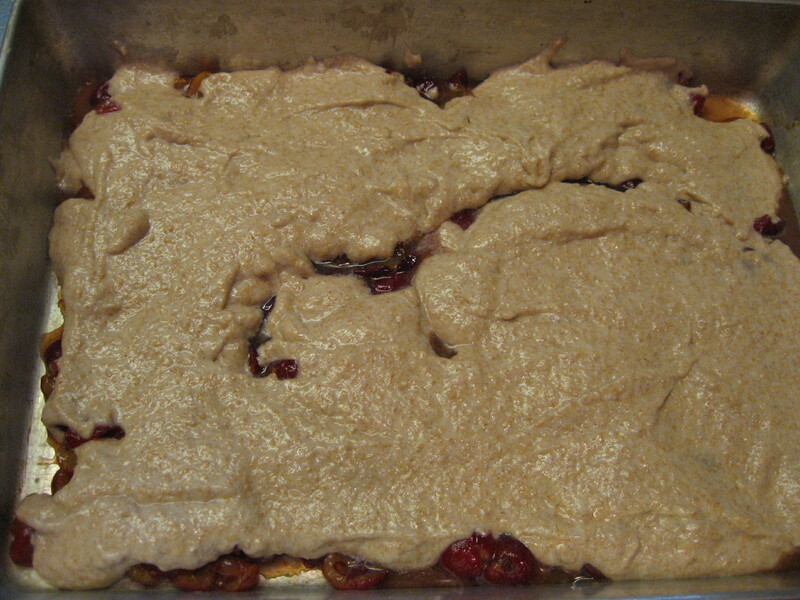 Spread dough over cherries. 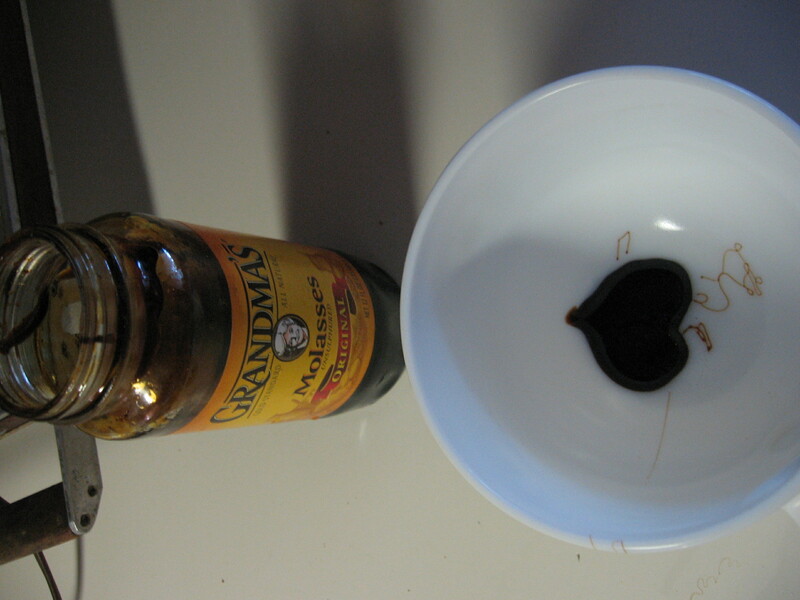 In a small bowl, combine 1 cup sugar and cornstarch. Stir in boiling water. Pour mixture over the dough. Bake at 350 degrees F (175 degrees C) for 45 minutes. Serve warm. Thanks a lot. Reminder, though I’m all about sharing, I also have essentially no income through my two blogs and food podcasts, so if you’re inclined, I’ll happily accept donations! 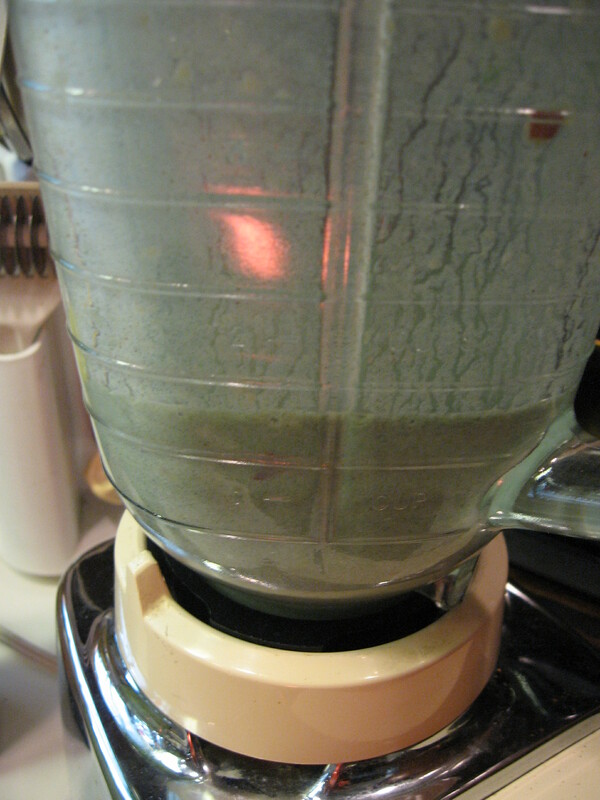 This entry was posted in delicious, food, health, medicinal, medicine, nutrition and tagged allergies, anti-inflammatory, avocado, bacteria, blue-green algae, cherry cobbler, detoxification, eye health, fruit, guacamole, health, immunity, nutrition, protein, shake, Spirulina, superfood, viruses on July 9, 2015 by carolkeiter. Here’s the link to the podcast of this particular meal: Sautéed Salmon with dill, brown rice and a colorful and delicious kale salad prepared with some chopped onion, tomato, thin slivers of cucumber, mushrooms, grated carrots and raw red beets with a topping of crumbled blue cheese and chopped walnuts with some sea salt and fresh ground pepper. This is tossed with a home-made balsamic vinaigrette dressing. Flickr link of pics of prepared food Sautéed Salmon with dill, fresh ground pepper and sea salt. I grind the sea salt in a mortar and pestle, then keep it in a little dish that I can dip into to spread the salt rubbing it between two fingers or with a spoon to tap it in. 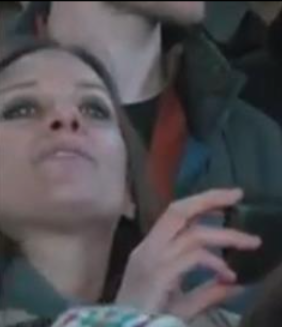 Using fingers controls the amount more precisely. I accompanied the fish with brown rice and a salad. The kale salad is made adding mushrooms, tomato, cucumber to the kale and then freshly grated red beets and carrots. Then i add the sea salt and black pepper and sprinkle in some crumbled blue cheese bits and walnuts. Tossed with my favorite homemade Balsamic Vinaigrette dressing; this involves marinating the garlic in the balsamic, then adding sea salt, fresh ground pepper, dijon mustard, a spoon of raw sugar and olive oil. 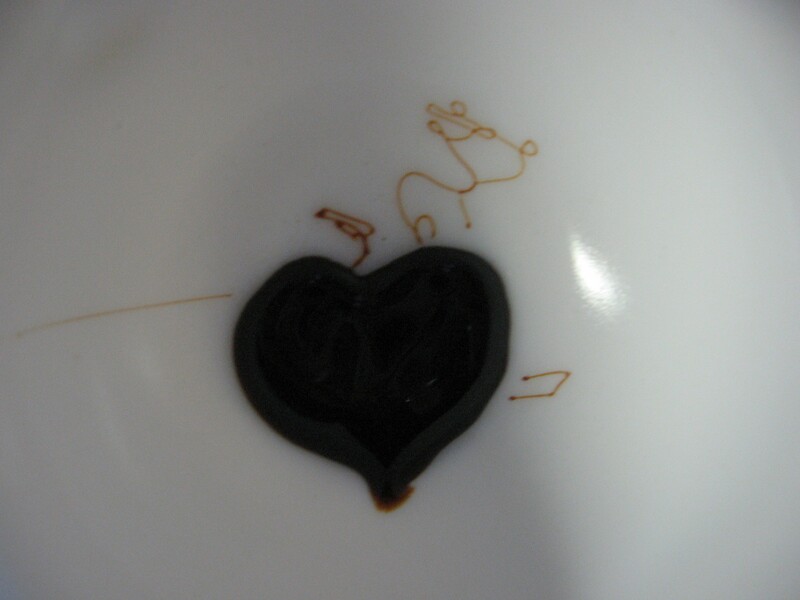 This entry was posted in delicious, food, health, medicinal, nutrition and tagged balsamic vinaigrette dressing, chili chocolate, cucumber, delicious, health, kale, kale salad, medicinal, melted bittersweet chocolate and chili, proactive cooking, red beets, sautéed salmon, sea salt on June 1, 2015 by carolkeiter. The ingredient that went into everything was garlic! The word of the podcast is ample! Here’s the link to the podcast describing the preparation. Thyme accompanied the stuffing for the Portobello mushroom and was tossed onto the Pork chop. Here are the pics, in order of progression of cooking. I loosely followed this recipe, frankly, only the marinade, and the baking temperature and time of 15 minutes. Enjoy! It’s delicious AND good for you! This entry was posted in delicious, food, health, medicinal, medicine, nutrition and tagged balsamic vinaigrette, blue cheese, delicious, food, garlic, kale, medicinal, pork chops, portobello mushrooms, red beets, tasty, thyme, walnuts on May 15, 2015 by carolkeiter. Here’s the link to the podcast for Curried Yellow Split Pea Soup. This entry was posted in delicious, food, health, medicinal, nutrition and tagged carrots, celery, chili, cumin, curried yellow split pea, curry, garlic, ginger, green cabbage, mushrooms, parsnip, piquant, spices, sweet bell pepper, turnip, vegetables on May 4, 2015 by carolkeiter. 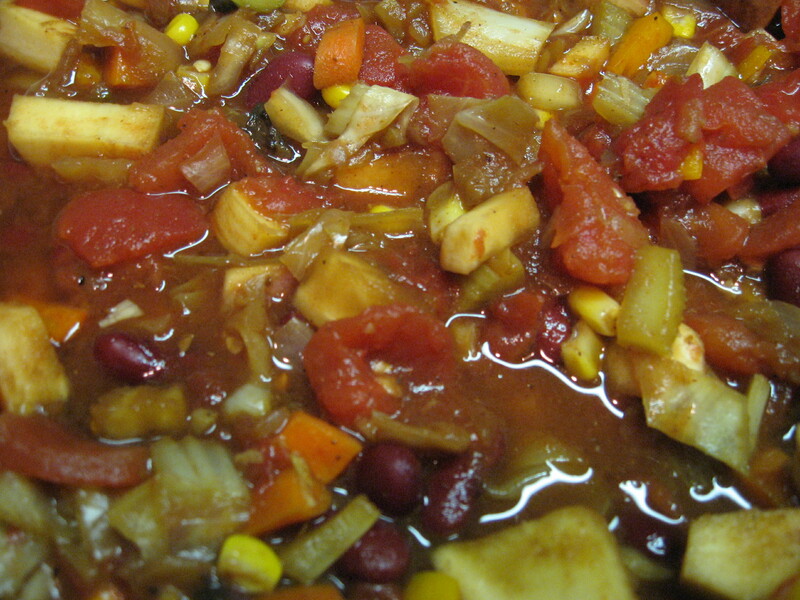 Here is Carol Keiter’s podcast of Hot & Sweet Chili con Carne – sweetened with molasses. 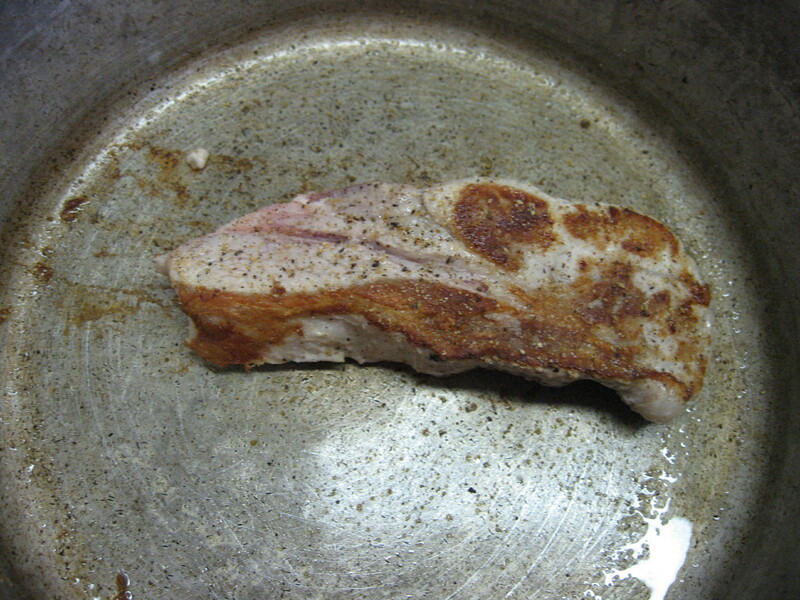 After searing the pork strip, I turned down the temperature and decided to leave the meat in the pan to sauté on low heat with some chopped onion in olive oil, to which I add the spices: salt, pepper, paprika, cayenne, chili, cumin and red chili pepper flakes. Sorry, I don’t really measure the quantity, I just sort of go by feel. I add some fresh chopped mushrooms soon after with the onion and wait for about 20 minutes or more to let this cook on the lowest temperature. 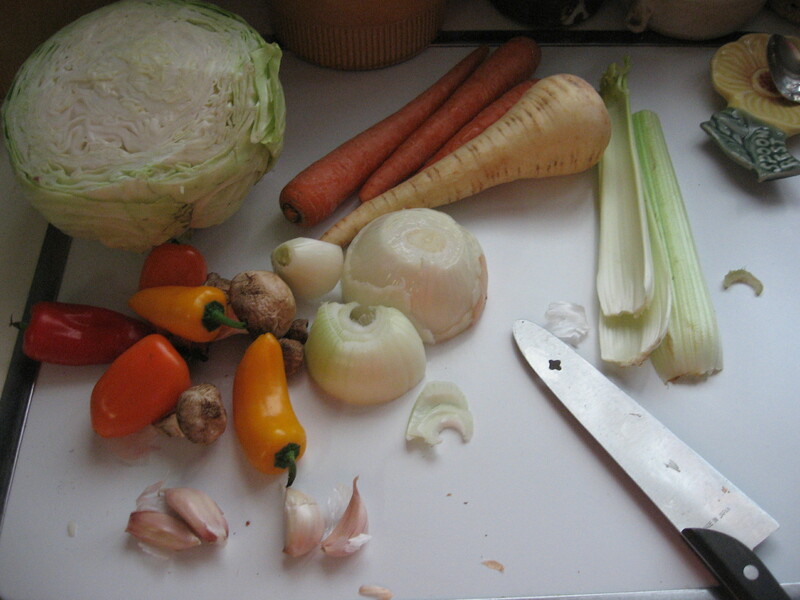 Then I’ll add all of the other chopped vegetables together with the garlic (garlic burns so I usually add it together with the green cabbage, which produces moisture while it sautés). 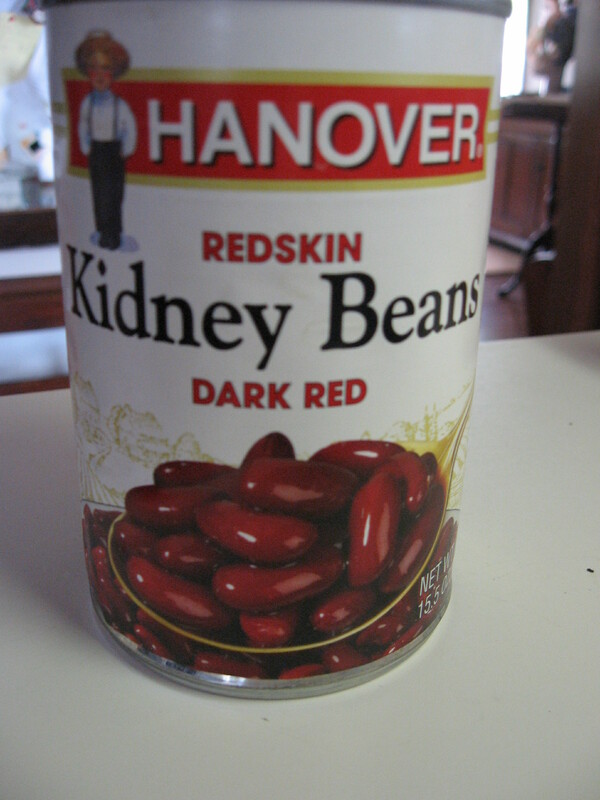 I would usually always use dry beans which I bring to a boil in water and then simmer in another pot, but I had a can of kidney beans which I used. After the spices and veggies have sautéed for a bit, I’ll add the canned tomatoes and tomato paste. 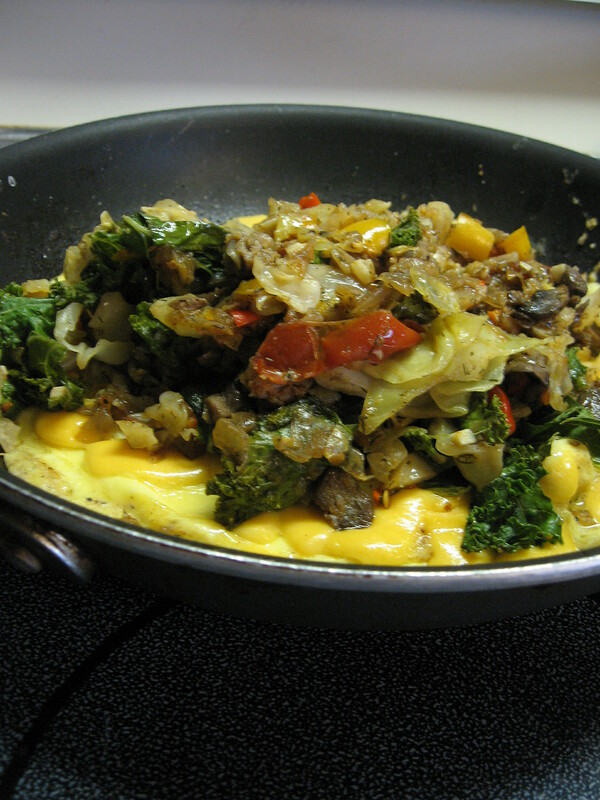 I’ll add some corn kernels at the end as well, just for flavor. I’m sure this is going to be a pretty hot and sweet chili! Enjoy! In fact, yes, it is, now that I’ve tasted it. It’s definitively hot & sweet! 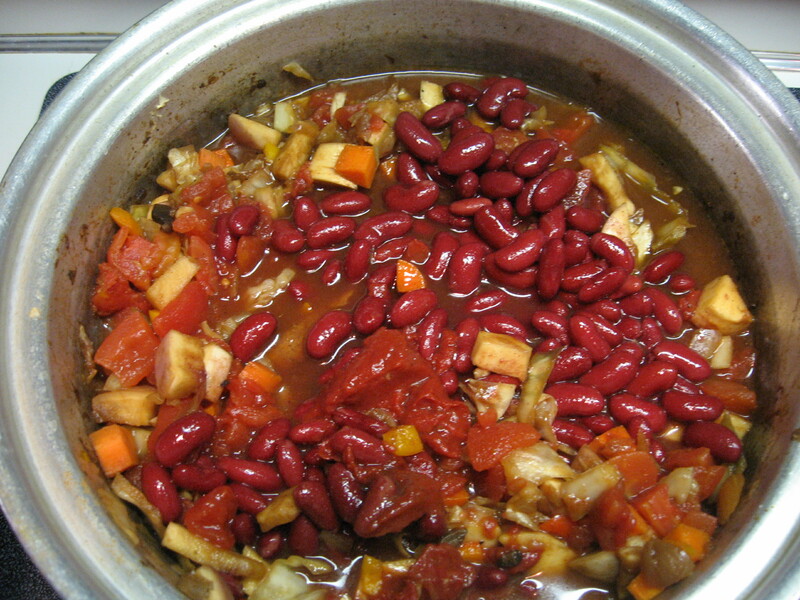 This entry was posted in delicious, food, health, medicinal, nutrition and tagged chili con carne, hot and sweet, kidney beans, molasses, spices on April 22, 2015 by carolkeiter. 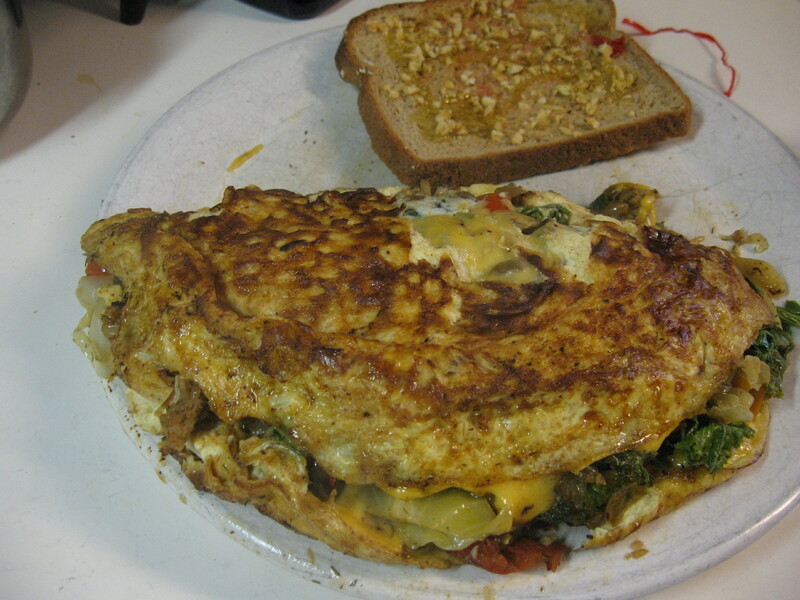 This link below engages the audio of the podcast I’ve created, while creating, the Omelette Deluxe. 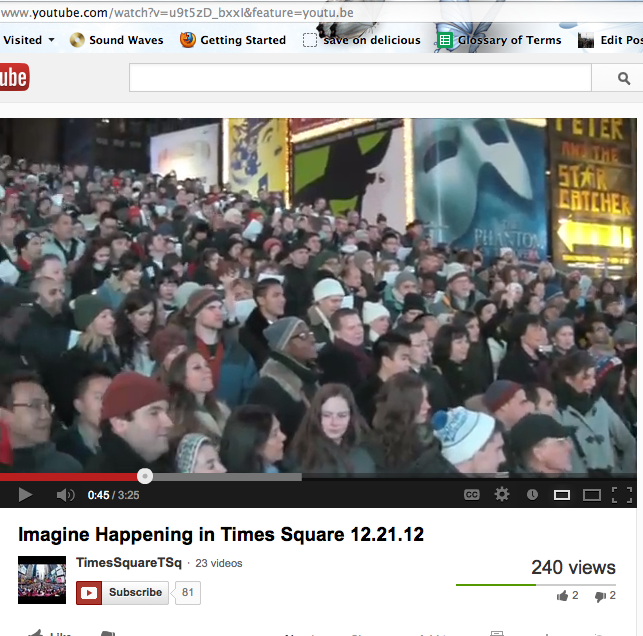 Because the audio opens in a separate window, you can listen while you also look at the pictures! 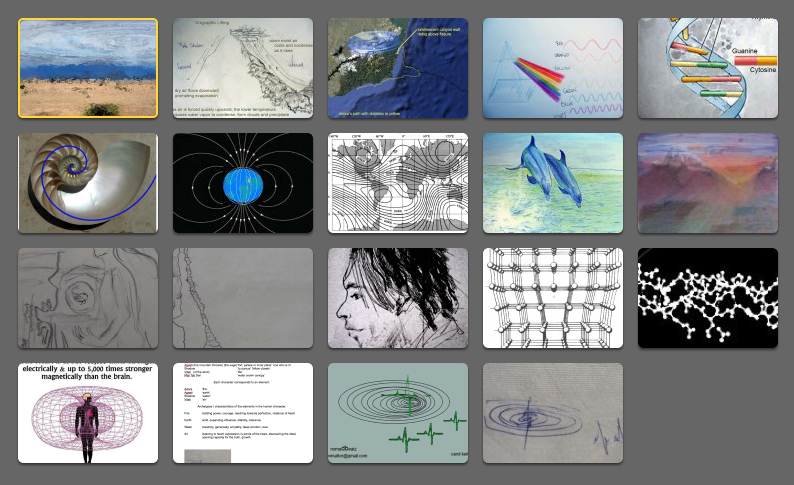 I had a few technical difficulties which I just figured out, because I’ve only done two of these podcasts combined with a WordPress blog and had not completely articulated the steps to convert and grab the audio file. Now i have! Some of my multitasking while I was preparing and cooking the ingredients of the omelette involved observing and taking photos of birds and other wildlife creatures out in the yard eating. I thought I’d show them, since these creatures are also enjoying eating – or hunting – for a fine meal! This entry was posted in delicious, food, health, medicinal, nutrition and tagged egg, food, nutrition, omelette, vegetables, vitamins on April 14, 2015 by carolkeiter. Here’s the text (I know I indicated before that text wasn’t a preliminary part of this blog) but here are the notes I wrote, from which I improvised the podcast. This is all about improvising. I had various ingredients that I’d used as the stuffing for a roasted acorn squash recipe, yet don’t have the squash. I also happen to have broccoli that needs to be eaten. The stuffing was great, so I’ve added my own combination of spices and a slight change in ingredients. I naturally started by washing the whole grain brown rice first and bringing that to boil, then turning it on low to simmer, while I chopped and started sautéing the rest of my ingredients. 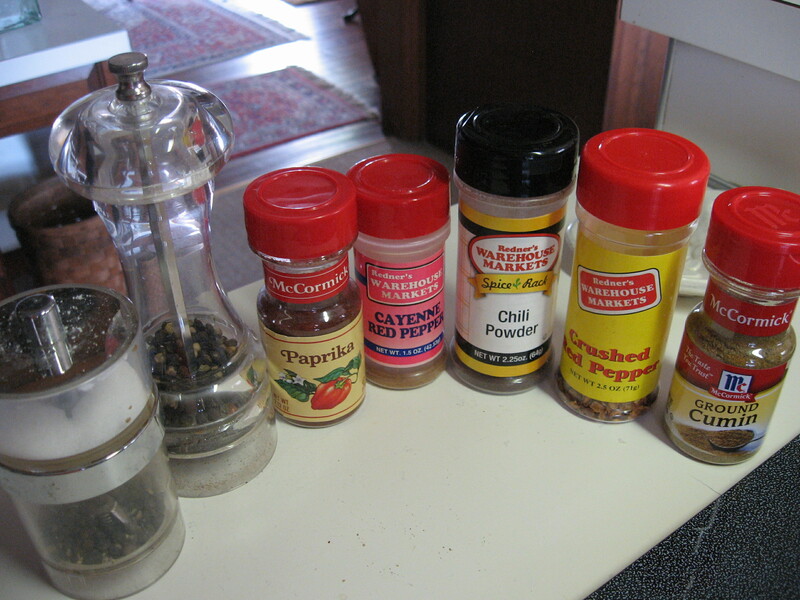 I like many of my dishes spicy, that is, various additional spices depending on the combination of foods, and often, with something hot, piquant. 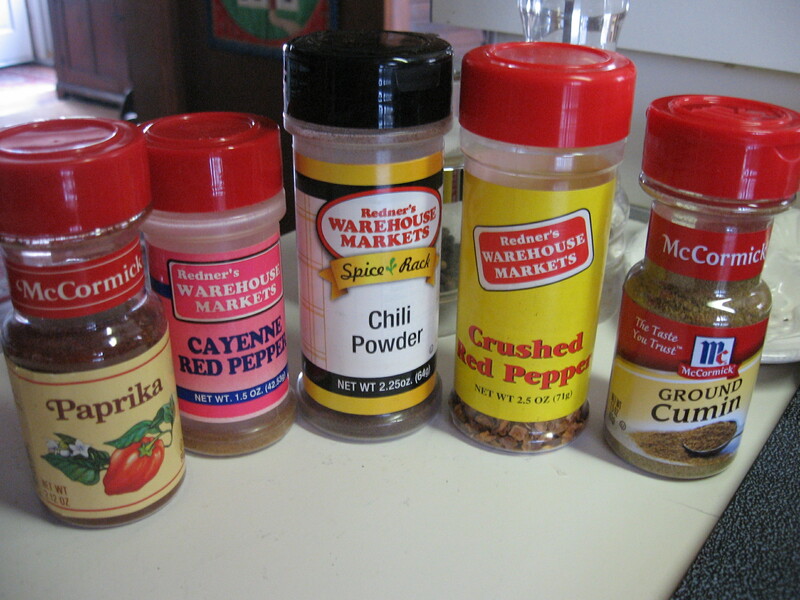 This time in addition to salt and fresh ground pepper I’ve added cayenne and some crushed dried red hot chili pepper. I also added left over from the summer garden some (thyme) and then I decided to add ground coriander again – using the mortar and pestle. One tip is to not wait too long to add the spices, they should primarily be added initially, with the onion, which often is sautéed on low heat, as onion becomes sweet when cooked on a low temperature over a longer period. In this case I had a bit of spicy Italian sausage to cook, so I did this separately on a higher heat first, then took it out of the pan and added a bit more olive oil so that the flavor of the sausage can be retained. you can also choose to do the onions on a higher heat – caramelizing them – in which they become slightly burnt and brown, with a nutty flavor. This is also a delicious technique for broccoli for that matter. Cooking on a higher temperature, for a shorter duration. This is something I learned from a dish my mother has frequently made. I decided tonight to pull out the broccoli and sautée it at a higher temperature in a separate pan, to create that additional nutty flavor. 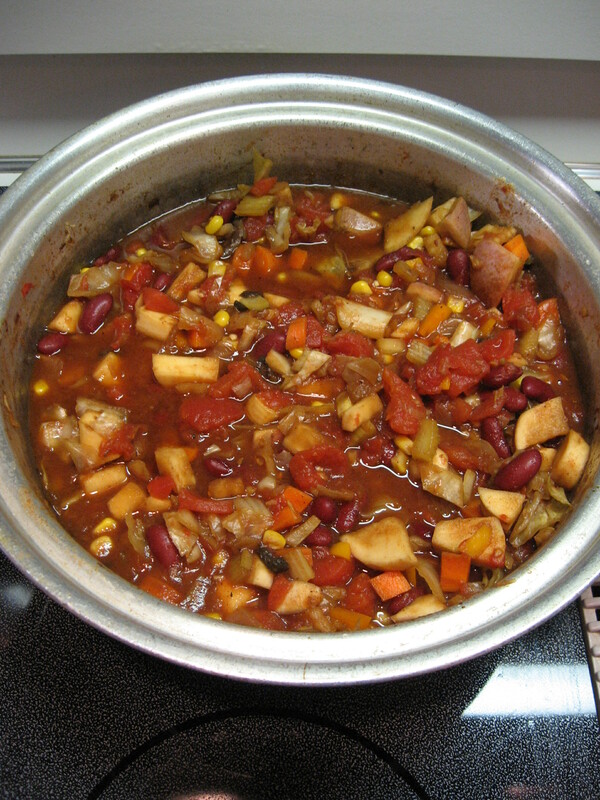 The last thing you want is over-cooked limp vegetables – unless you are going for that consistency in a soup, for example. And the last thing i want is bland food that has no flavor. At the end, I’m going to toss on some grated parmesan and crushed walnuts. by the way, the pictures I show on the site reveal the ingredients I’m using. I’m using cheaper ingredients, because I have uh hum, no income presently. If I had a steady flow of income, I’d be using the finest quality pepper corns and sea salt from special regions of the world as well as fresh or dried spices of the finest quality. I will be adding grated parmesan cheese and broken walnut pieces as a topping at the end. However, I would always recommend (if the budget allows) to purchase a chunk of good quality parmesan or similar cheese and grate it yourself, rather than buying and packaged/pre-fab\pre-grated cheese. The fresher the better! All of this makes a difference. However, if you don’t have the budget, you can still eat fabulously tasty food that is also great for you. And this is coming from the mouth of someone who has chosen to live with a much leaner income, while developing my art. I’ve therefore inadvertently learned to live meagerly. My fortune, is that I learned growing up about how to eat healthy foods…and later on my own, situationally, it turned out that the foods that have been affordable ALSO happen to be really good for you: less meat, oatmeal, yams & sweet potatoes, vegetables…not to mention, eating less of a quantity! I’ve been able to stay slim due to what I’ve called my ‘poverty diet’. This is because I haven’t had the luxury to eat whatever I want, whenever I want. I simply haven’t been able to afford randomly ‘eating out’ at my whim. Back in the days that I lived in San Francisco with steady work and income, I ate out frequently, in a town known for great restaurants. Yet living later in New Mexico and especially abroad in Berlin, it was slim pickins’ and I mirrored this by becoming pretty skinny. I’ve also chosen bicycling as my transportation, so that I’ve balanced maintaining regular physical exercise with eating good quality food, nutritious food, and really not a whole lot of it. I’ve been in a habit (against the mainstream of eating small amounts with more frequency) of going for long stretches of time without eating anything at all. Such as 12 hour stretches between breaking the fast and my dinner ~ (but that’s just me 🙂 I get quite immersed in projects I’m doing and simply don’t feel like taking the time break to eat, when I can do that as a reward, after I’ve finished the other stuff I’m involved in. My lesson at the end of this cooking blog is this. It’s great advice I read several weeks ago regarding striving for quantity over quality. A potter divided her class in half, and asked the half of the students to study and plan their technique to master the most perfect pot. She asked the other half of the class to get the clay out and just start making pots. In the end, those students who aimed through study and deliberation to make the single perfect pot, were surpassed by those students whose goal was to make as many pots as they could. They wound up learning through doing, and came up with ultimately the best pieces of pottery. I personally can have a tendency towards wanting perfection, and therefore sometimes becoming frozen in even getting started on some tasks…so, my advice is to dive in, you will only learn. And the mistakes you make and questions you have will ultimately bring you more knowledge and enlighten others who may have the same questions. I find this site helpful for investigating http://www.epicurious.com/archive/seasonalcooking/farmtotable/visualguidefreshherbs#10 and identifying herbs and spices, if you aren’t sure what you have! This entry was posted in delicious, diet, food, health, medicinal, medicine, nutrition and tagged cooking, cooking tips, delicious food, diet, epicurious, health, improvisation, podcast, quality, quantity on March 5, 2015 by carolkeiter.